Shopping Malls and Centers, Fund Raisers, Children’s Shows, Assemblies, Events, Preschools, Grammar Schools, Middle Schools, High Schools, Libraries and wherever families gather. Now in the Albuquerque/Santa Fe area. Johnny Moon is one of America’s finest children’s entertainers! Ask about, live animals, puppets, comedy, balloons, costumes, games and illusions. Here is the complete promotional package to support and enhance your center’s advertising campaign and quality image: Draw big crowds with entertainment in your center. Increase foot traffic and attract new shoppers. Good for all ages. Makes your center a place for people to come with the family and children for a quality, fun time shared experience. We will work with you to develop a special themed event – a weekend of magic. Our staff can also consult with you on concept and ad design. We promise to do what you need us to do in order to make your show exciting, enjoyable and profitable. We can offer strolling; sleight-of-hand; an amazing stage show and/or special feature effects for the season and/or any combination. Most importantly, there’s always an abundance of fun and laughs. Do you need to raise money for your cause or project? Call Johnny and he will come to the rescue. At no cost to you, Johnny will show you how to put on a Gala Comedy Magic Show that will raise that much needed money. Ask about our Gala Comedy Magic Show fund raiser package. The Birthday Girl or Boy or your Special Guest becomes Star Wizard for the Day. Everyone participates in making the magic happen. The show is completely interactive with the comedy built around some really amazing magical effects. The show can be structured to teach magic as well as offer gifts and give-a-ways. Johnny is one of the most experienced kid’s performers at birthday parties in America with thousands of shows to his credit. Johnny takes the worry off the parents by taking care of everything. 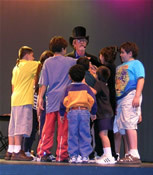 Johnny’s vast experience performing for children spans 35 years with thousands of shows. 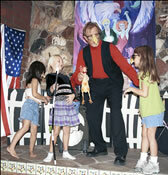 He is a master children’s performer and may very well have the most experience of anyone in his field. You can count on a laugh-filled, action-packed, interactive show with many motivational and educational ideas. 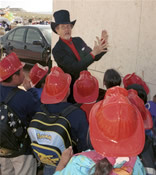 Johnny starts his presentation in a free and easy way by interacting with the children. He dresses in regular clothing so as not to make some of the more sensitive children apprehensive. These shows are very special and very silly, yet lessons are learned. The little tikes are very special to Johnny and many, many shows and hours of development have gone into these performances. Johnny can hold an audience of young people as long or longer than anyone in his field. Ask about all the different themes. How wonderful to be able to perform comedy magic for incredible children of this age! They get to see a master magician, learn good manners and how to watch a live artist in performance. Of course, there is always a giant amount of laughs. 35 years and thousands of performances have perfected these shows. To see Johnny hold the audiences in the palm of his hand is truly magical. Special tools and experience is essential to handling this group. They appreciate good magic, especially if it has an unusual twist. They love comedy and especially enjoy watching their peers on stage. Johnny is the essence of the hip, cool and “rad” persona with a real affinity for this audience. Special Magical Reading Show. Our magical reading events are always an experience that librarians love. You may ask Johnny to use your theme with magical special effects or choose from Johnny’s many special ideas to promote the power of reading. One of the most popular Johnny Moon reading shows is “It’s All About Chickens”. See Johnny Moon perform the magic of reading and watch his wife, Annie, perform the giant version of her children’s book called, “The Rooster’s Feather.” Then, see the book come alive when Johnny materializes a giant 7 foot chicken at the conclusion of this lively performance. Click here for more about library performances.